At LOF-Xpress™ we count on well trained, customer focused technicians and cutting edge technology to provide you with an efficient and high quality oil change. These are the things that set us apart from our competition and make us the best of the best in the oil change industry! We’re committed to giving you a new quick-lube experience – from start to finish. Even before the oil change begins, we utilize several unique technologies, most of which are outlined below. The entire oil change process at LOF-Xpress™ is automated, beginning with our kiosks. 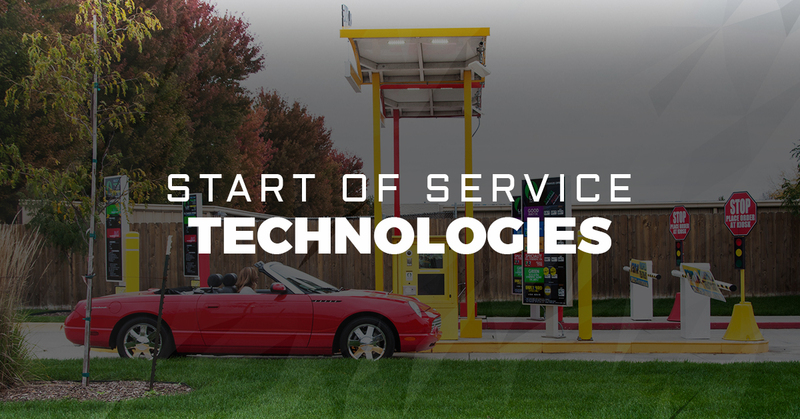 This is where you’ll find a touch screen write-up station that allows our cashiers (with drive-thru headsets) to walk you through the process of selecting which oil change is best for your vehicle and if any additional services are needed. This particular technology then prints a numbered ticket, with selected services for your review. At this time, any and all additional information for first-time visitors will be entered and used for future visits. As a returning customer, you may have noticed that our RFID readers (radio-frequency identification, in case you were wondering!) automatically scan your vehicle’s information into the ticket to expedite the write-up and ticket creation process AND to create a record of services, used for future visits. No wasting time. No duplicating work that is already done. We know you’re busy and value the time (& trust!) you’ve given LOF-Xpress™ to do our job. We are committed to doing it efficiently and thoroughly. Finally, the last pre-service technology you’ll encounter prior to the actual oil change are our bright signal lights in the drive-up lanes. These change colors (red-yellow-green — you know the drill) wirelessly to help signal your turn for service and guide you into the bay. Never again will you have to wonder if you’re going the right way or doing the correct thing – we’ve eliminated the stress and confusion by utilizing technology even before your actual oil change begins! It is our privilege and commitment to provide you with a fully automated, yet customer service centered, oil change each and every visit to LOF-Xpress™. Stay tuned for another complete blog posts on during service, inside the bay technologies coming soon!